Leave long skis to the more experienced skiers. It's second nature to most women to stretch -- or shrink -- the truth a bit when someone asks your weight. But when it's time to get fitted for skis, shaving off a few pounds might mean getting the wrong equipment. Several factors go into ski fitting, including your experience level, weight and height, so bring all your pertinent -- and true -- stats to the fitting. Many manufacturers have different weight charts for ski length. Finding your length based on weight is the first step for finding the right skis, and each weight bracket tends to increase the ski length by 5 centimeters. 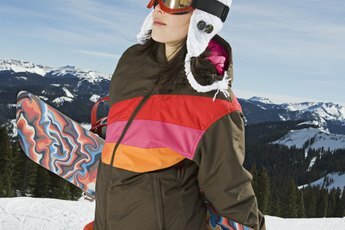 Generally, women between 110 and 125 pounds should use a 145-centimeter ski; women between 125 and 136 pounds should go up to 150 centimeters; those between 151 and 165 pounds should opt for a 160-centimeters ski; and those between 180 and 190 pounds should go for a 175-centimeter ski. 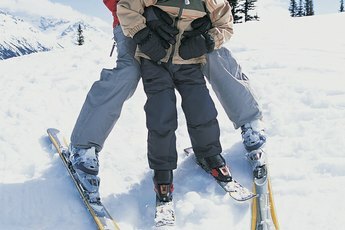 Beginners should opt for a ski about 10 centimeters shorter than their respective weight range; intermediate skiers should lop off 5. To make sure it's the optimum ski length for you, also factor in your height. Convert your height to centimeters, and the correct ski length should be close to that number. Your height helps determine your center of balance, and it's essential to get the length correct when springing for skis to help you maintain your balance. If you're an aggressive skier or weigh more than average for your height, a ski slightly longer than your height might help you stay upright on the slopes. For beginners, or those who weigh less than average based on height, skis about as high as your chin might give you the ride you're looking for. You'll likely need a longer ski as you go up the weight spectrum because you need that length to keep you floating gracefully on top of the powdery snow. The extra length distributes the weight over a larger area, keeping the skis from sinking. Using a wider ski width can also help distributing the weight to the sides. Even if your weight forces you to use skis slightly longer than your ability level dictates, you'll at least have the weight to turn them. If you're on the lighter side, stick to the shorter end of your length range to give you maneuverability and to ensure you don't lose traction. Ability level is a big determining factor -- more experience typically equals longer lengths, which allow you to go faster but aren't always as maneuverable. Also look at the shape of the skis. Camber skis curve up slightly in the middle, making you push harder with your legs to curve them downward instead to grip the snow. These skis are more for avid skiers. Rocker skis already have a downward curve in the middle, making them easier to maneuver for beginners and intermediate skiers. If you're opting for camber skis when you're not an advanced skier, keep the length on the shorter end of your range until you become proficient with the shape. How Much Weight for Women Using a Leg Press Machine? Does Weight Really Matter on a Snowboard?